National textile workers strike in the summer of 1934. 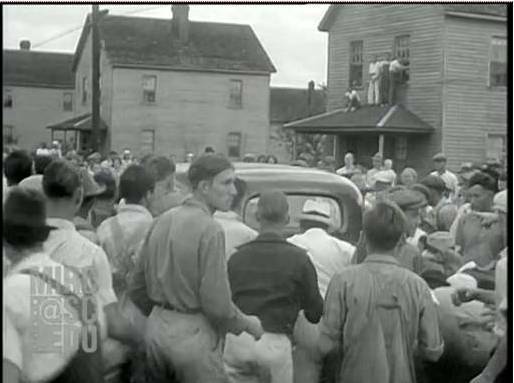 Shows workers stopping automobile of Sheriff Clyde Robinson, followed by National Guardsmen advancing with bayonets. R051 HAR v.159, 1929. Harper's Magazine. Vorse, Mary Heaton. "Gastonia". Harper's Magazine, Vol. 159, 1929 (November) : p. 700-710. 051 LIT NCC. Literary Digest. "Fighting Communism with Anarchy". Literary Digest, Vol. 102, July-Sept 1929 (September 28), Editorial : p. 12. "The Gastonia Strike-Murder Verdict". Literary Digest, Vol. 103, Oct-Dec 1929 (November 2), Editorial : p. 14. "Sinclair Lewis on North Carolina's Labor War". Literary Digest, Vol. 103, Oct-Dec 1929 (November 9) : p. 36-48. 051 NAT NCC. The Nation : a weekly journal devoted to politics, literature, science, drama, music, art, industry / founded 1865. "Another Sacco-Vanzetti Case?". The Nation, Vol. 129, July-Dec 1929 No. 3343 (July 31), Editorial : p. 106. Broun, Heywood. "It Seems to Heywood Brown". The Nation, Vol. 129, July-Dec 1929 No. 3351 (September 25), Editorial : p. 319. Lewis, Nell Battle. "Anarchy vs. Communism in Gastonia". The Nation, Vol. 129, July-Dec 1929 No. 3351 (September 25) : p. 321-322. "Justice in Gastonia". The Nation, Vol. 129, July-Dec 1929 No. 3345 (August 14), Editorial : p. 160. Porter, Paul. "Justice and Chivalry in Carolina" The Nation, Vol. 129, July-Dec 1929 No. 3347 (August 28) : p. 214-216. Lewis, Nell, Battle. "Tar Heel Justice" The Nation, Vol. 129, July-Dec 1929 No. 3349 (September 11) : p. 272-273. 051 OUT NCC. Outlook and Independent. "The Gastonia Case". Outlook and Independent, Vol. 152, 1929 (Aug 14), Trend of Events section : p. 612. "In North Carolina". Outlook and Independent, Vol. 153, 1929 (Oct 16), Trend of Events section : p. 254-255. Wharton, Don. "Poor White Capitalists". Outlook and Independent, Vol. 152, 1929 (Oct 16) : p. 252-253, 279. 051 REV NCC. Review of Reviews. Edmonds, Richard Woods. "The Workshop of the Carolinas". The Review of Reviews, Vol. 80, 1929 October 1929 : p. 71-74. Shaw, Albert. "Contrasting American Conditions". The Review of Reviews, Vol. 80, 1929 September 1929 : p. 37. Shaw, Albert. "Labor in the Carolina Uplands". The Review of Reviews, Vol. 80, 1929 October 1929, Progress of the World section : p.48. North Carolina -- Gaston County -- Industry -- Textiles -- Strikes. -- This file contains articles on the Loray Mill strike of 1929. "Class War in North Carolina" New Republic, Vol. 60, September 1929 : p. 137-138. "Gastonia and the Honor of the South" New Republic, August 7, 1929 : p. 299-300. "SOUTHERN textile mill owners . . ." New Republic, November 20, 1929 : p. 359-360. "THE EFFORT of the American Federation of Labor to unionize . . ." New Republic, November 27, 1929 : p. 3.